Wolde Gossa Tadesse for reviewing prior to publication. An ancient people speaking an Omotic language, the Gamo protect remnant forests, burial grounds and traditional assembly places across Ethiopia’s vast southwestern plateau. Today, the highlands are home to about a million people, of which the Gamo are the main ethnic group. Subsisting on small holdings and communal grazing areas rich with sheep and cattle, the Gamo cultivate a variety of crops, including cereals and fruit trees and the all-important staple enset (“false banana”). Most Gamo live in traditional “beehive” huts in small family clusters and they are known internationally for their beautiful, detailed weaving. Now wholly located within the semiautonomous Southern Nations, Nationalities and People’s Region, the Gamo Highlands spreads over 1,600 square miles, rising above lakes Abaya and Chamo. Gughe Mountain, at 9,842 feet, is the highest peak along the undulating chain that overlooks the Rift Valley extending south to Kenya. The highlands region contains a diversity of plant and animal life, encompassing several ecosystems including Afroalpine grasslands and evergreen Afromontane forests. The monsoonal rains and deep aquifers feed the Sago, Zage, Maze, Domba, Deme, Kulano, Gogora, Saware, Wajifo, Baso, Harre, Kullafo, Sile and Elgo rivers and provide water for the people and the fertile fields in the lowlands. Essentially an unusual form of wetland, the highlands are home to 792 plant species and a rich bird population as well as aardvarks, porcupines, vervet monkeys, baboons, jackals, mongoose and hyenas. There are great sections of rare native bamboo forest, especially on the flanks of Gughe Mountain. The Gamo culture is bound intimately with the land. According to Desalegn Desissa, a plant ecologist who has studied the area, the Gamo’s “traditional activities depend on a harmonious relationship with the local environment, which frequently contributes to minimizing environmental disruption and thereby maintaining an overall ecological equilibrium.” In the highlands, the Gamo have protected at least 272 sacred groves along waterways and on the tops of hills, these being the remnant forests of formerly vast Afromontane woodlands. Within the groves, the people keep their ritual relics and perform sacrifices, healings, harvest rituals and fire ceremonies that symbolize the connection between the past and the future. There are rainmaking and rainstopping ceremonies and thanksgiving rituals, all of which recognize the peoples’ dependence upon the earth to provide for their sustenance and livelihoods. Many groves are also bossa (burial grounds). Surrounding these burial forests are balee (grasslands) where people mourn but which also function as buffer areas that are off limits to grazing and cultivation. Besides protecting sacred groves, the Gamo continue to practice organic and terraced cultivation and composting, which has greatly controlled soil erosion and water pollution and allowed them to cultivate 91 percent of their total land area. Careful use of manure as fertilizer is a key to soil fertility throughout the region. According to Desissa, the sacred groves are “believed to be the gray hairs of Gamo elders; they are a paternal symbol, a protector of communities against misfortunes.” A study by the Ethiopian Wildlife and Natural History Society found that biodiversity in sacred groves is higher than in nonsacred forests and that the sacred groves are often a refuge for plant species that have been eradicated in other areas. The groves also contain great numbers of endemic species, making the highlands exceptional for East Africa. In each of the sacred groves scattered across the region, an eqaa (ritual leader) is responsible for leading community ceremonies and is also considered the “father” or traditional custodian for the grove. In this system, knowledge is transmitted to younger generations from stewards of the spiritual life, who hold the community responsible for the protection and well-being of the lands and waters. With Ethiopia’s massive population growth and the longtime coexistence of state and traditional tenure, very few forested areas remain, which has led to poor water and soil conditions throughout the country. In the Gamo Highlands, the Gamo are finding it more and more difficult to maintain the sacred groves and related network of traditional sacred sites. Besides overgrazing, tree cutting and encroachment by church members, the Gamo now face a formidable cultural and religious obstacle: the Church. Both the Ethiopian Orthodox Church and a new Pentecostal church called Qale Hiwot (also known as Mulu Wengel or Meserete Kiristos) have targeted sacred groves in their proselytizing efforts, building churches within sacred groves and the traditional “buffer zones” and encouraging new converts to cut trees to demonstrate their fidelity to the Christian faith. In recent years, Professor Zerihun Woldu and a group of researchers from Addis Ababa University and the Ethiopian Wildlife and Natural History Society (EWNHS) have begun mapping sacred sites and collecting data on plant and animal diversity in order to better understand the role of indigenous stewardship. Where a location is defined as sacred, the people have a strict set of rules guiding human conduct and use. In collaboration with many members of the community and in consultation with the elders, the researchers were able to define 12 types of “major traditional sacred locations,” including kashaa (forest), dubushaa (outdoor assembly places), boncho zummaa (mountains), boncho shafaa (rivers), kalloo (pasture lands) and bonchetida fultoo (springs). The Gamo also have designated sacred areas for lamentation and consider some caves, stones and paths to be sacred as well, with soil from those areas used as a traditional medicine. The EWNHS has begun to lead workshops in conjunction with the Cultural and Art Society of Ethiopia and Arba Minch University. They distribute information to increase awareness of the importance of the forests and other sacred sites to not only the cultural integrity and diversity of southern Ethiopia but also the biological diversity and environmental health of the region. The Friends of Gamo Gofa Sacred Landscape Association has also formed, bringing together traditional custodians and regional government administrators to do long-term planning for the protection of sacred sites. In addition, the EWNHS has donated seedlings to many local farmers who have then established indigenous tree nurseries with the aim of reforesting the sacred groves and expanding forest perimeters. To support the work of the Ethiopian Wildlife and Natural History Society, write them at ewnhs.ble@ethionet.et or visit their website. Desissa, Desalegn. “The Biocultural Diversity of Living Indigenous Sacred Landscape in the Gamo Highlands of Ethiopia.” Ethiopian Wildlife and Natural History Society, 2007. Cartledge, Daniel M. “In-Situ Conservation Practices of the Gamo Highlanders of Southwest Ethiopia.” Presented at the International Rice Research Institute, Los Banos, Philippines, January, 1999. Makko Wareo. SLFP interviews conducted on location in Ethiopia, December 2008. McLeod, Toby. 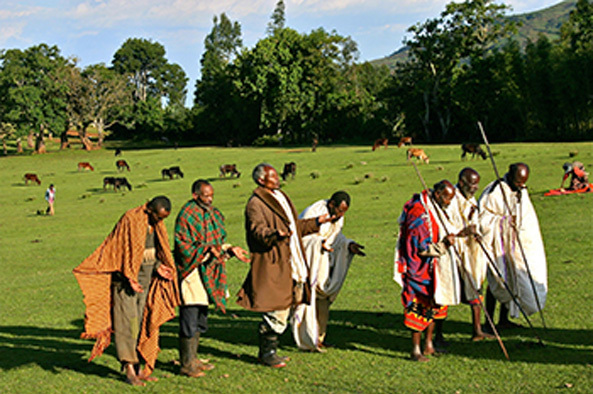 “Ethiopia — Cradle of Life.” Sacred Land Blog.